Need to add some more deep breaths to your daily routine? An essential oil diffuser can help you remain calm and uses incredible scents to help you get through every day. We’ve assembled a list of some awesome products to help you find the best diffuser for essential oils. If you’re new to essential oils, we’ve included some helpful info that can help you find the best diffuser for you. Capacity: The capacity you need can depend highly on where and when you need to use your diffuser. A smaller capacity is perfect for desks and offices. A larger capacity can be great for large rooms or houses. 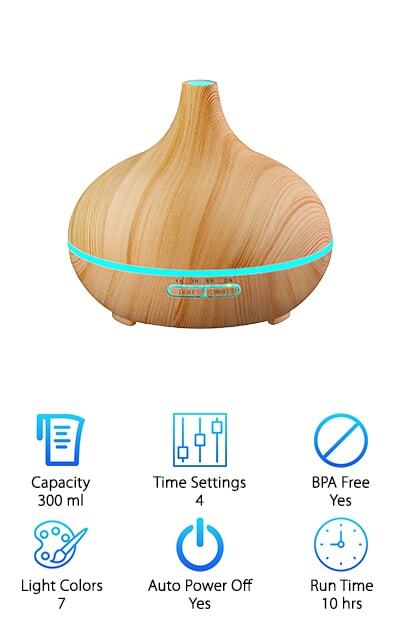 Time Settings: If you’re planning on using your diffuser for short bursts of relaxation, choose a diffuser with a few time settings so you can time it for just a few hours. If you’ll be leaving it on all the time, these settings aren’t necessary. 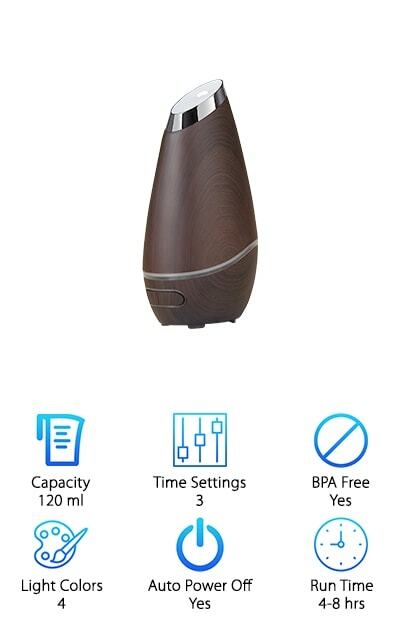 BPA Free: Since essential oil diffusers produce steam that you inhale, choosing one that is BPA free ensures that you’re not getting more than you bargained for when you turn on your diffuser. Light Colors: If you love a certain color or want to create a truly relaxing atmosphere, choosing a diffuser with multiple color settings will help you get in the mood any time of day. Auto Power Off: Choosing a diffuser with an auto-off function is great for people who want to use their diffusers primarily for sleep. With an auto-off function, you can sleep well knowing your diffuser won’t run too long while you’re asleep. Run Time: This is another helpful function for people who like to use their diffusers while they sleep. A long run time means you can sleep through the night well and wake up to the amazing scents of your diffuser. Now that you know what to look for in essential oil diffuser reviews, let’s get to our list of amazing products. Our top and budget picks are the best places to start, as they’re what we consider the best of the best. We’ve included amazing products, and our other eight picks will also help you get to your happy place with amazing essential oils. We hope these diffusers help you find peace in your home or office. 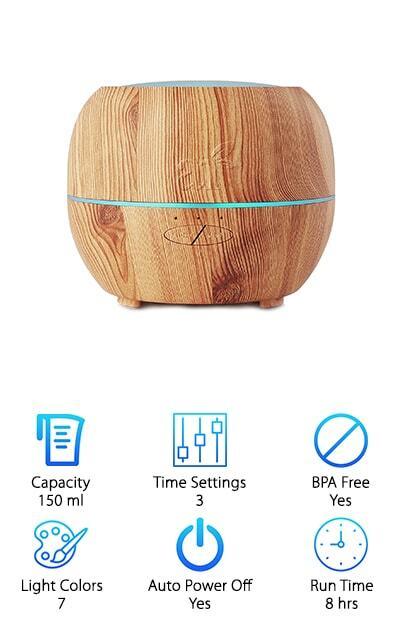 This beautiful wood-style diffuser is one of the best diffusers for essential oils on our list. The beautiful wood-style exterior comes in five different colors. The colors available are black, brown, light brown, grey, and reddish brown. These styles come with a light band around the middle that tells you the diffusers on, and the light band changes colors depending on the accent color that is best suited for the diffuser. If you don’t like the default color, you can choose from seven different colors and two colors modes. The soft light produced creates a romantic and peaceful atmosphere through the room. This diffuser looks great in any room and has a very natural feeling to it. It can hold up to 300 ml of water and produce up to 30 ml of moisture per hour. It can even run for up to 10 hours of continuous output. Our budget pick is a cool looking diffuser is perfect for people looking to add a little color to their life. This Gorgeous diffuser is all about the seven LED light colors available. It emits a calming light that can help create an aura of comfort and serenity in any space. This diffuser is compact, so it’s the perfect choice for people who need to freshen up their office space or any other compact area. 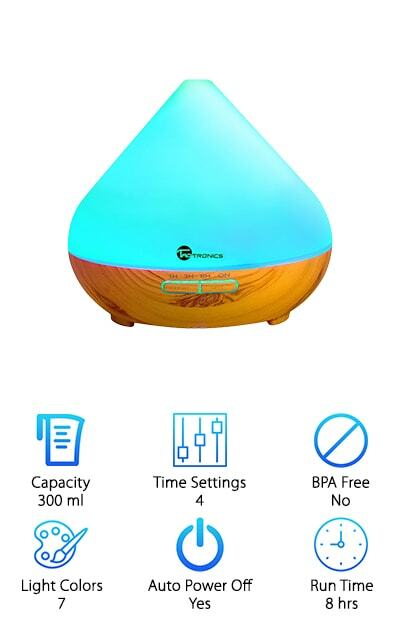 This diffuser also acts as a humidifier, combatting dry air and helping you avoid dry sinuses and skin. It also can function as a nightlight, so it's a great choice for kids. It has an auto shut-off for using while you sleep, which will automatically power down the diffuser when the water runs out. This diffuser can hold 100 ml of water and can run for about six hours. It has two mist settings so you can customize how your diffuser functions. There’s nothing better than coming home to a soothing and relaxing environment. This diffuser delivers on the relaxation on two fronts- with its large 150ml tank and seven different LED light color options. These things combined turn your home into a sanctuary of wonderful smells and colors. This diffuser runs with a whisper quiet motor that helps you enjoy a peaceful and calm environment. This is especially great for people who like to use their diffusers while they sleep, as it will not disturb you. The auto off function allows you to leave your diffuser on overnight without worrying about it using up all of your favorite oil. 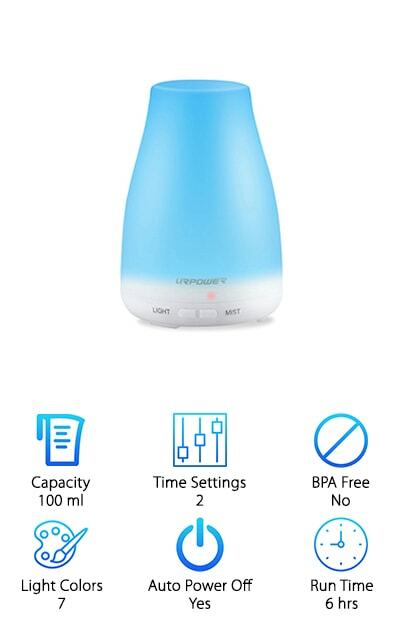 This diffuser has two settings, continuous mist, and intermittent mist, which allows you to choose which style works best for you at any given time. All the long meetings, traffic, and everyday stresses are sure to lift away with the sweet smell of your favorite essential oil and the calming light of this diffuser. This diffuser is perfect for a larger room, like a kitchen or living room. It holds 300 ml of water, which means it can be used all day long to provide you with your favorite scents. If you don’t want to leave it on all day, it also has one hour, three hours, and six-hour modes that allow you to time how long your diffuser is left producing mist. This diffuser has a natural looking wood bottom that adds to its calming effect. It comes in two colors- a light and a dark brown. It also has seven color options, each with a bright and dim mode. This lets you create the perfect ambiance for you. This helps you get the most out of your diffuser and feel a wave of calm every time you turn it on. It also has a low water safeguard that keeps it from running on too little water and potentially damaging itself. This is a great pick for anyone looking for a large oil diffuser. This diffuser holds a massive 500 ml of water, making it a great choice for anyone who doesn’t want to be constantly refilling their diffuser. It can also run for 10-16 hours, which is an incredible length for any of the diffusers we’ve looked at. This diffuser is perfect for putting in a central location in your house and letting your whole family benefit from essential oils. 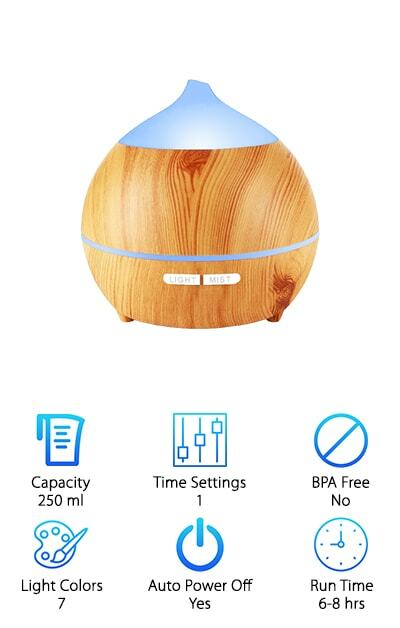 It is also a humidifier and can help moisten your skin and keep your air fresh. The fragrance of the essential oils can help you relax and even get a great night's sleep. This diffuser has two levels of incredibly quiet mist functions. It also has an auto-off safety switch that prevents overheating when the water runs out. It also has seven different LED light colors. Though this essential oil atomizer is last in our last it is certainly not least. This diffuser provides a beacon of beautiful colored light. It also has a unique and beautiful shape that makes it stand out in any room or space, but as a symbol of peace and calm, not as an eyesore. 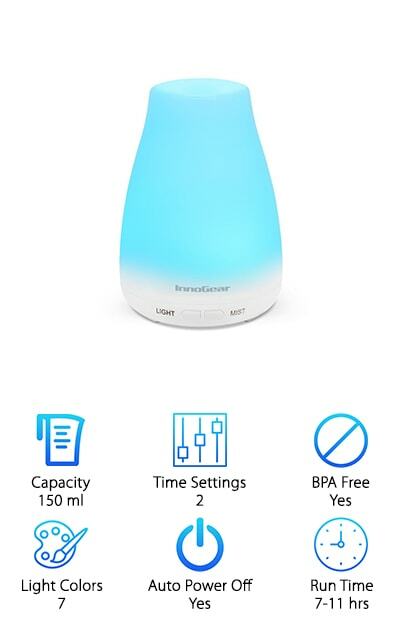 The best thing about this diffuser? It comes in a two pack so you’ll have double the diffusing power. This is perfect for people who want a diffuser for two different spaces in the house. You could even put one in your bedroom at home and one in your office for an amazing scent that follows you all day long. 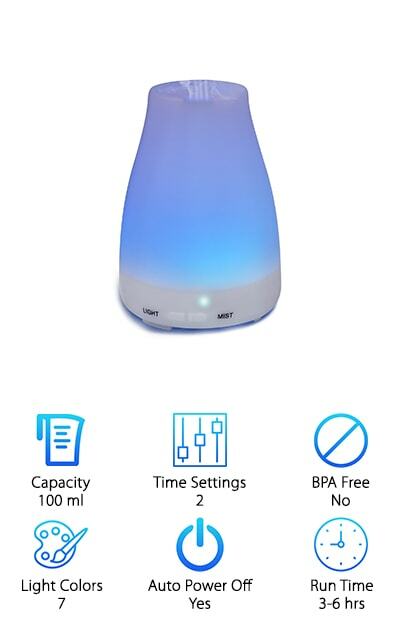 This diffuser is perfect for long days, as it emits a calming light and mist that can help remind you to take a deep breath and continue with the day. Each diffuser comes with a 120 ml capacity which allows it to diffuse for a long time. This natural looking oil diffuser is the perfect complement to any zen space. It comes with seven different color changing LEDs to allow you to create the most calming space possible. It also works as a humidifier to keep you healthy and happy. The huge 250 ml tank can keep you comfortable and happy for 6-8 hours of use. The auto shut off feature means this diffuser automatically turns itself off when it’s depleted its water supply, so you’ll never have to worry about running for too long and damaging your diffuser. 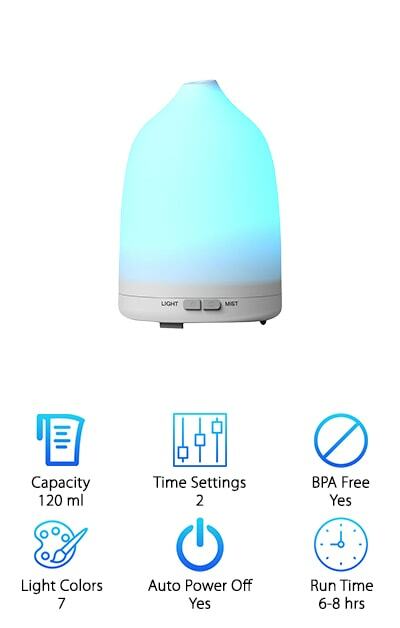 This diffuser is perfect for anyone trying to create a calming environment while they sleep, as it has a whisper quiet motor that is sure to add to your sleep, not keep you awake. This is a great diffuser for people looking to create a zen space all day or all night. Its calming lights and smells are sure to have you cool calm and collected in no time. This diffuser is a great pop of color in any room or small space. It has a 100 ml capacity so it can run for a long time without taking up too much space in your room or even on your desk. The portable and compact design means you can even travel with it if you’re not willing to give up your diffuser on the road. It comes with all the basic safety features like auto shut off so you’ll never have to worry about accidentally damaging your diffuser by leaving it on for too long. The two modes allow you to customize how long your diffuser runs for and how much essential oil it diffuses. It comes with both a continuous and intermittent mode that allows you to easily diffuse oil into any space easily and quickly. It runs for three hours in continuous mode and six hours in intermittent mode. 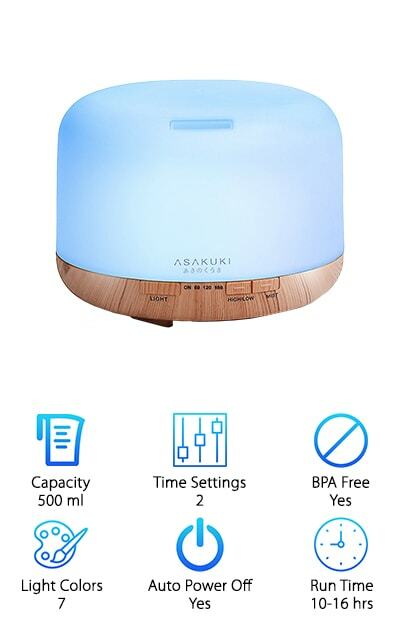 This beautiful diffuser is not only great for stress relief and humidifying a room, it looks amazing doing it. It comes in four colors so there’s something to suit everyone's style. The colors available are dark brown, light brown, pink, and silver. It uses ultrasonic technology to deliver safe, heat-free, and smoke-free mist. This means you can feel comfortable using it for long periods of time or even all the time. The sculptural design adds to the style of your space instead of being an eyesore in the corner. It comes with seven colors of soft glowing LED light to help you get in a stress-free mood. The motor is virtually silent so you’ll forget it's even there. The auto-off function makes it easy to leave your diffuser on without worrying about it damaging itself. This function automatically engages when you run out of water in your diffuser, so all you have to do to start it up again is add water. This sleek looking diffuser is great for anyone looking for something modern to complement their style. This diffuser looks great in any home and adds to your style instead of messing with it. The dark wood exterior is a perfect match for any room. The LED light band can be adjusted to match your room or your mood. This model is incredibly quiet and you won’t be disturbed by the noise of the diffuser, even if you leave it on all night. So go ahead, let your diffuser lull you to sleep at night with soothing lights and smells. It also comes with three different mist settings- high, medium, and low. These settings help you create the perfect environment for stress relief. It’s even 100% BPA free, which means you’ll never have to worry about harmful chemicals getting in the way of your essential oils. The easy-to-remove top panel makes it a snap to use your diffuser all the time.